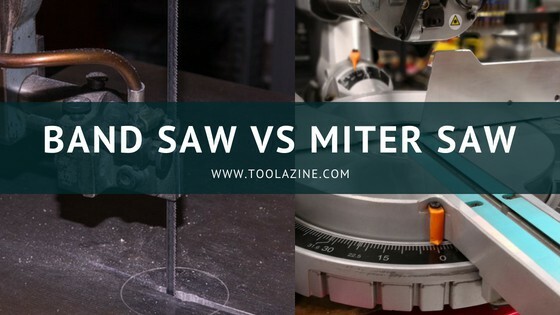 Toolazine Band saw vs miter saw: what are the differences? Band saw vs miter saw: what are the differences? If you are a woodworker, you know that adding new power tools to your collection is never enough. And if you are missing a band saw and a miter saw, my suggestion would be to go shopping. But wait – what are the differences between these tools? A band saw is a stationary tool that is used for curved cuts on different materials. On the other hand, a miter saw is a tool that is used for making straight and angled (miter) crosscuts. It is not possible to make accurate strait cuts with a band saw and it is not possible to make curved cuts with a miter saw. Even if you know nothing about power tools, you will easily notice that these tools are completely different. Not only for their usage but also on the outside. So, a band saw has an endless moving blade that has teeth only on one side. It is a versatile tool, mainly used for curved cuts, and it can cut through thick materials as well. If you need to make irregular shapes, or rip lumber, the band saw should be your pick. On the other hand, a miter saw is a semi-stationary tool that is used for cutting wood at different angles. The blade is mounted on a swing arm that moves left or right. It is great for cutting pieces of same dimensions, and it is used for making frames for doors, pictures, and crown molding. Miter saws can be found in different variations. In this section, you will be able to understand the differences between these tools through direct comparison. Without any more hesitations, let’s go. A band saw is a very versatile tool that deserves a place in your garage. It is made of two wheels – upper and lower and their diameter indicates the size of the bandsaw. The blade is an actual band that goes around the wheels, so when the wheels turn, the blade moves and the teeth are always pointed down towards the table. Moving the upper guide allows you to cut materials with different thickness. Apart from wood, you can cut aluminum, brass or copper. Many bandsaws can cut up to 6 inches, and some can go even beyond that, up to 12 inches. You can understand the importance of this once you need to make a curve cut on a large piece of wood. If you have a fence, you can use the bandsaw for straight cuts, just like a table saw, with the only difference that here you don’t have the risk of a kickback. To understand what a band saw is used for, check the video below. A miter saw, also known as a chop saw is the perfect pick if you need to make repeated cuts in the same length, as well as miters and bevels. What makes it much different from the band saw and other types of saws is that the board is stationary and the blade moves in order to make the cut. Most of the miter saws you will find can move in both directions. However, this type of cutting limits the length of the cut to the diameter of the blade, which is why this tool is mostly used for crosscuts. Related – What is a crosscut? Although you can make this type of cut with a table saw, the miter saw is a quicker option. Once you make the cut, the blade retracts back and if you use the guard you will be safe from any potential injuries. Plus, you can use clamps to fix the wood that you are cutting. To get a visual of how this works, how to perform a cut while having maximum safety, take a look at the video below. It is a complete tutorial of why do you need a miter saw, and what you need to know about it. If you are looking for a quality model and you are able to spend some more money on it, the Laguna Tools MBAND 1412-175 is the right choice. It is very simple to use, extremely powerful and excellent when we talk about curved cuts. The blade can be easily changed, and with the fence you get you can cut straight like you would with a table saw. It is more expensive than the other bandsaws, but try and find at least one downside on it – that would be a pretty difficult task. Buy the Laguna Tools MBAND 1412-175 here on Amazon. If your budget is limited, but you desperately need a bandsaw, consider this product. Even though it is cheaper, it is designed to handle almost every task. It comes with a fence for straight cuts and can handle wood, but other materials as well. It is easy to adjust and has a LED light for better visibility. Click here for more detailed review. Buy the SKIL 3386-01 here on Amazon. See my review of the best band saws under $200, $300, $400, $500, $600, $700, $800, $900 & $1000. One of the best miter saws available on the market – powered by a 15 Amps motor, it provides optimal cutting accuracy. It has extremely solid construction, and the alignment system needs no recalibration, which makes it durable but also very accurate. It is a good pick for both delicate working and heavy-duty framing and deck building. It may cost you a bit more than other saws, but it is worth every cent of its price. Buy the DEWALT DWS780 here on Amazon. As one of the greatest manufacturers, Makita produces quality miter saws as well. It has a powerful motor of 15 Amps that provides up to 4600 RPM. It doesn’t matter if you are a woodworker, a carpenter, or cabinet installer, this model can offer a variety of different applications. If you need a power tool for precise miter and bevel cuts, the Makita LS1040 is the right choice for you. It is a quality miter saw, very durable and easy to use. Buy the Makita LS1040 here on Amazon. To sum up, a bandsaw and a miter saw are completely different tools. Depending on your needs, you will need to make your pick. If you need curved cuts, go for the bandsaw, or if you need angled and bevel cuts, choose a miter saw. Which tool do you have? Feel free to share your opinion on this topic and don’t forget to share this article with your friends.